You'll get quad speakers and Smart Keyboard support, but in a marginally thicker and wider body. It's February, which means we're likely just one and a half months away from the next Apple launch event -- one where we can expect a 4-inch "iPhone 6c" "iPhone 5se" and an "iPad Air 3." So what's new? Well, today we received an image that's allegedly a simple dimensional drawing of the aforementioned tablet. While we'd usually dismiss such leaks, we're siding with our reliable source on this one. 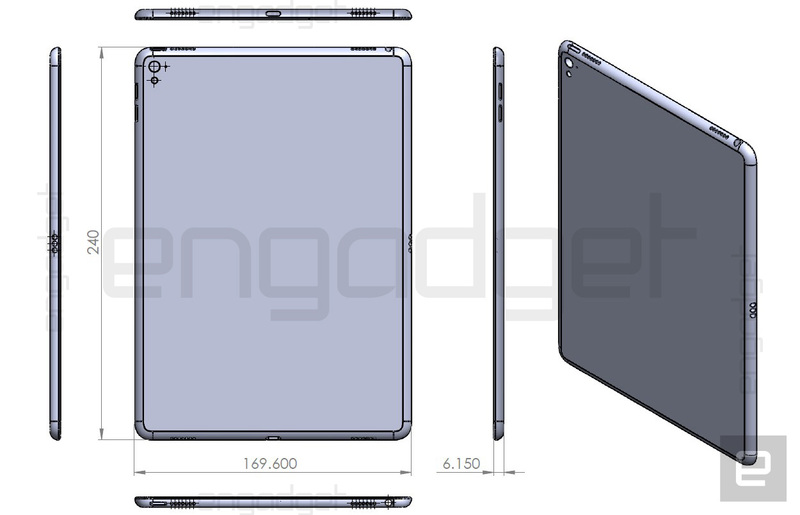 Unsurprisingly, the next iPad will apparently pack a couple of features introduced by the iPad Pro: quad speakers for some nice audio boost, and a Smart Connector on the side for its very own "smart" accessories. This goes well with the earlier Pencil support rumor. What does surprise us is the extra hole below the camera, which suggests the iPad will finally be getting an LED flash. Hooray for tablet photographers! Alas, as with all things in life, there is a slight trade-off with these extra goodies. If the dimensions listed here are to be trusted, then it appears that the iPad Air 3 will be 0.05 mm thicker and 0.1 mm wider than its predecessor. If you recall, there were similar marginal differences between the iPhone 6s models and their iPhone 6 counterparts. Existing soft cases for the iPad Air 2 will probably fit the new tablet just fine, but hard cases may scratch the body over time -- as is the result of forcing some iPhone 6 cases onto the iPhone 6s. Besides, it's not like you'll want to cover up the LED flash nor the two extra speakers, anyway (nor the Smart Connector, if you're picking up a smaller Smart Keyboard for this new iPad). We tried squeezing more info out of our contact but that's all we got for now, so stay tuned for an update or hold out for the supposed launch in mid-March.